It is my sincere hope that these women will serve as inspiring role models for girls and women all around the globe to discover their unique paths and leave their own distinctive exclamation marks on the world. Happy Living’s mission - to improve the health and wellbeing of the world, one person at a time - carries it into Sedona, Arizona to celebrate inspiring women. 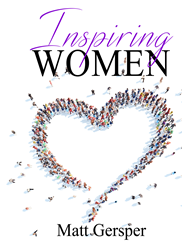 Inspiring Women is the fifth book published by Happy Living Books Independent Publishers. “We’re excited to honor Northern Arizona local, Karen Conover, at our Sedona event,” says Mr. Happy Living, Matt Gersper. Karen is an entrepreneur, educator, and fourth-degree Black Belt Tae Kwon Do Master. She owns and runs KC’s Family Tae Kwon Do in Cottonwood, Arizona. Dinner, drinks (and fun) are all free for the first fifty people to register. Happy Living only asks that each guest buy two books at the event (2 for $20). Check out all Happy Living titles here: http://www.happyliving.com/books. Happy Living is on a mission to improve the health and wellbeing of the world, one person at a time. We write to inspire others to take action on their ideas and to believe that a better self is always possible – today, every day and for the rest of their lives. The Seven Foundations of Health guide our blog, books and talks and is our framework for creating a more meaningful, successful, and happy life. Matt Gersper and a handpicked team of Happy Living Experts practice Happy Living every day and collect ideas to share with you along the way. New members receive a free book and inspiring five-minute-to-read blog posts, rousing mini one-man Blog Theatre™ shows, and other special promotions. Join us at http://www.HappyLiving.com.